PRESENTED TO HIM BY THE SULTAN OF TURKEY IN 1879. PRINTED FOR THE AUTHOR BY J.B. LIPPINCOTT COMPANY, 1885. All my life, or for fifty years I had desired to see and examine genuine Arabian horses, such as I could know to a certainty were strictly thoroughbred Arabians. That they were rare indeed in any country I knew. Writers upon them were very superficial, being mostly tourists or travellers, interested in geographical matters, or in the people, customs, and relics, with traditional associations, seldom if ever being horsemen, capable of judging with just comparison, if I except Sir Wilfrid S. Blunt, of England, who, as an equine investigator of remarkable ability, in company with his wife lived with the Arabs of the desert for that express purpose, and to whom I am indebted for very much valuable information upon the subject. Different Presidents of the United States, also Secretaries of State, have at various periods received splendid horses as presents from Arabia or Turkey; the last President receiving such a gift previous to General Grant being, I believe, James K. Polk. In 1860 the late William H. Seward, while Secretary of State, had two fine specimens sent to him from Syria; but after the novelty of their arrival wore off, none could tell what had become of them, while those loudest in condemnation or ridicule of Arabian horses could neither say they had ever seen one, nor speak with personal knowledge of the get by any thoroughbred Arabian stallion. In the matter of ex-Secretary Seward’s Arabians, while many were ready to condemn, few could remember having seen them; nor could any one point me to the get of either horse upon which to base credit or discredit. Persistent inquiry, oral and by letter, after five or six years’ time, gave me the first and last of Seward’s two Arab horses, now dating back twenty-five years; and the information I obtained may soon startle such as are interested in “time standard” breeding rather than blood. Suffice it to say, however, that this information determined me to become personally interested in the two Arabian stallions presented to General Grant. As General U.S. Grant outranked in the estimation of the people of the world any representative man America had produced, both as General-in-Chief of the victorious American army and as the unanimously re-elected President of our great Republic, it is but natural to suppose the Sultan of Turkey would honor himself and his Empire by presenting to the General the very choicest specimens of their idolized horses, the Arabian. At the time of their arrival in this country I was compiling a work devoted to Old Henry Clay, to be entitled a “History of Henry Clay;” and for the purpose of having correct sketches of representative sons and daughters of the horse, had engaged Herbert S. Kittredge (since deceased), whom in 1876 I had encouraged to make horse portraiture his profession. Young Kittredge resided with me, as did later Andrew J. Schultz, who was to study under him. When General Grant’s Arabians were thoroughly recovered from their voyage and acclimated, I sent Kittredge to sketch them, as frontispieces to my “Clay History.” also illustrative of blood influences; Henry Clay being a third remove from the Arabian upon the paternal side, and largely inbred to that blood maternally through imported Messenger, First Consul, and Rockingham, all of which were of Godolphin Arabian blood, and Messenger himself was inbred to it. Young Kittredge’s success was wonderful. I presented copies of his sketches to General Grant, to General E.F. Beale, to Paymaster-General J. Adams Smith, and to Hon. Erastus Corning, also to one or two other gentlemen friends whom I believed trustworthy. “I return you my thanks for the pictures of Leopard and Linden. They are the best horse pictures I have ever seen, and are the most faithful likenesses, being great credit to the gifted and talented Kittredge. As General E.F.Beale received the stallions and kept them at his place, “Ash Hill,” near Washington, for three years, he was a competent critic of Kittredge’s work. In a similar manner wrote Paymaster-General J. Adams Smith, of the United States Navy. General Smith being an expert horseman, and long having Grant’s Arabs in charge, his opinion is of equal value. Then again, Major J.K.Levitt, for fifty years known in Philadelphia as an expert horseman and judge of horses, pronounced the two sketches by H.S.Kittredge as the most perfect likenesses of the two stallions which he had at any time seen of any horses. Mr. Levitt was the man who first received the stallions to exhibit, which he did for three months after their arrival. 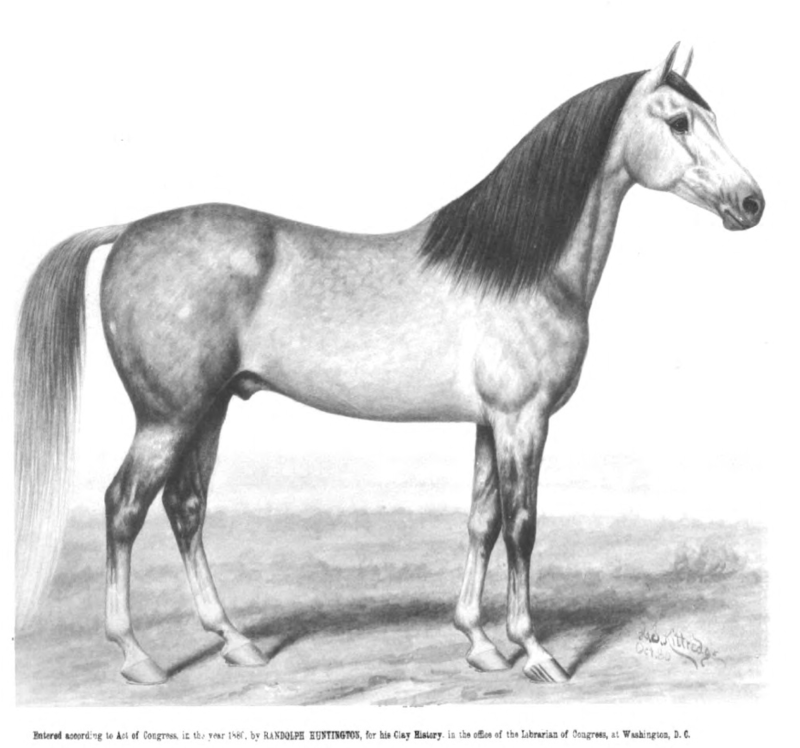 I am particular in quoting these criticisms upon my sketches as exhibited in this book, because I have seen numerous prints and photographs purporting to represent General Grant’s Arabian stallions, no one of which has been the least like them. My sketches are the horses to life, upon paper: and the proofs sent me by Messrs. J.B. Lippincott Company, of Philadelphia, were such excellent reproductions that I intrusted the publication of my work to them. HOW I CAME TO ISSUE THIS BOOK. Early in May, 1885, I received a letter from a gentleman, introducing himself as a personal friend of General Grant and his family and, as such, requesting that I give him a transcript of my papers pertaining to the General’s Arabian stallions; as to their shipment from Constantinople, date of shipment, name of vessel, commander, port of entry and date of arrival, also consignment; referring me to General Grant or either of his sons as to himself. By the next mail another letter came from the same gentleman asking permission to publish extracts from my private letters to General Grant and his son Ulysses regarding the two stallions, and my stallions by them; also asking pictures of my young horses by Leopard and Linden. While the refinement and courtesy of this gentleman’s letter was such as to assure me of his good intent, I felt obliged to decline his request. As pirating of my expensive sketches, with plagiarism of my public writings, had been the order of the day for the past three years, I had grown recluse. I will now devote my pen to the two horses Leopard and Linden Tree. The two names as I give them are the English translation of the Turkish; but in speaking of them, the word Tree is left off, making the names as given the two stallions, Leopard and Linden. These two stallions arrived in this country May 30, 1879. They were first heard of in Philadelphia, where they were exhibited in General Grant’s name. Early in the spring of 1880 I went to Washington, D.C., to see and to examine them, also to learn if I could breed to them. General E.F.Beale, a lifelong true and warm friend of General Grant, also a great horse-lover, had the two horses upon his beautiful farm “Ash Hill,” just outside the city, and near to the Soldiers’ Home. Unfortunately, General Beale was in California, looking after his large interests upon the Pacific; but I learned that Paymaster J. Adams Smith, of the Navy Department, had the Arabs in charge, and was also a most thoroughly informed horseman. I called at the naval Pay-Office, found the officer disengaged, and enjoyed a long and interesting conversation with him upon Arabian as well as other horses in the East, and all over the world in fact, for they seemed to have been a special study with him at every port he had visited. It may surprise some of our so-called horse-breeders that a naval officer, who had spent most of his days at a naval academy or on board ship, should be better informed than some professional breeders upon land; but I have found it to be frequently the case with both naval and army officers. Men are born with the breeder’s gift, and no matter what their calling may be, that gift is there, waiting only the opportunity for development. A breeder should be a liberally-educated man, and by nature a worker, which unfortunately few are. He should be a physical worker, also a mental worker, withal a thinker; and my word for it, there is not one moment for play or recreation, scarce even for social conversation. Some of my very best correspondents upon the questions of animal life in years gone by have been officers in the army and navy. Paymaster (later Paymaster-General U.S.N.) Smith was by instinct a breeder and handler of horses; or, as the saying is, “was all horse” when not otherwise engaged. He was a splendid driver, and superior to most landsmen in the saddle; indeed, I considered General Beale fortunate in being able to leave General Grant’s Arabians in charge of so able a gentleman, during his trip to California. Remember, this was the spring of 1880, and the horses had been at “Ash Hill” only since the fall of 1879. I was impatient to see the Arabs; so after dinner Paymaster Smith ordered his light wagon, and as I write I think of that delightful ride to “Ash Hill.” Arriving there, the smiling, happy-faced little darkies greeted us with “massa” dis and “massa” dat, as in the old days, the happiest of my life. In front of the stables, upon a beautiful table-land overlooking acres of meadow pasturage, with scattered barns and hay-ricks, was a level spot of close, fine turf, splendid to show horses upon. Upon this the colored groom Addison led out first the Arab Leopard. He was a beautiful dapple-gray, fourteen and three-quarter hands high; his symmetry and perfectness making him appear much taller. As he stood looking loftily over the meadows below, I thought him the most beautiful horse I had ever seen. With nostrils distended and eyes full of fire, I could imagine he longed for a run upon his desert home. Addison gave him a play at the halter, showing movements no horse in the world can equal but the thoroughbred Arabian. He needed no quarter-boots, shin-boots, ankle-boots, scalping-boots, or protections of any kind; and yet the same movements this Arabian went through would have blemished every leg and joint upon an American trotting-horse, even though he had been able to attempt the to him impossible activity. He was now brought to a stand-still that I might examine him; not cocked on one leg, pointed in another, or straddled, as our horses would be after such violent exercise, but bold and erect on all fours, as when first led out. I began at his head. The ear was very small and fine, much as Old Henry Clay had. The muzzle was small and fine, the mouth handsome, and lips very thin, as were the nostrils. Between the eyes he was full and broad, while the eyes themselves were large, brilliant, and of the speaking kind. I lifted the lids, and they, too, were thin and delicate, not coarse and heavy, as in our big-mouthed, thick-lipped, long, heavy-eared American horse. The jowls were very deep, but wide between (so much condemned in Henry Clay). The windpipe was large and free, running low into the breast. The neck was beautifully arched, giving the impression of a thin crest, which I expected to find, from numerous writers’ reports. Imagine my surprise when, upon running my hand from between the ears down, I found a big, thick, hard crest, as if a three-or even four-inch new cable-rope were inside. This was exactly such a crest as was in Old Henry Clay, which lopped over like a bag of meal with old age; and I remembered having an old Messenger stallion, years ago, with exactly such a crest, which, falling over in the same way with age, was a great torment to my pride. How I do punish myself in these days, to think of the green sheep-pelt sweats I gave this noble old Messenger stallion to get the crest so it would stay up in place! Verily, boys and young men are fools, but they do not know it. Well, Leopard and his groom, Addison, remained perfectly still until I had run my hands over every part of the horse’s body, from the tips of his ears to the bottom of his feet, even to examining the texture of his skin or hide, to see if it contained any spots. 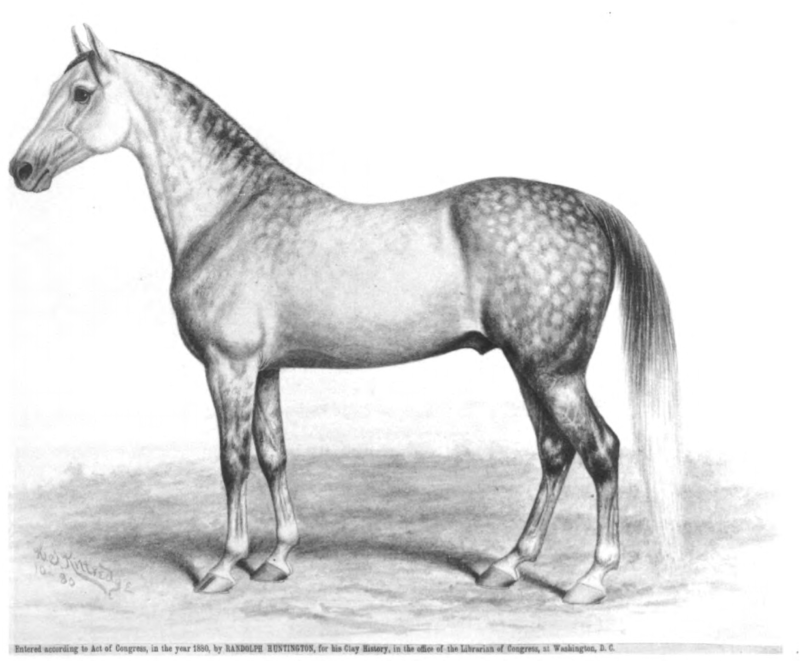 No more perfect animal ever lived than General Grant’s Arabian stallion Leopard. I have been accustomed to handling stallions for the past thirty years, hence look first for the disposition. At this time Leopard’s disposition was excellent, or, as ladies would say, “lovely!” and “sweet!” Twice this horse has taken the first premium at the “National Horse Show of America” over his stable companion Linden. Linden Tree (or Linden, for short) was now led out. This horse has been called a “jet-black” by some papers, which was a mistake never corrected by such journals. At that time, the spring of 1880, Linden was a beautiful, smooth, blue-gray, which this summer of 1885 has changed to a white-gray. In height he is the same as Leopard, fourteen and three-quarter hands, which is the usual height of the thoroughbred Arabian. In build he was more compact than Leopard, being deeper and broader; of more substance, but with just as clean and fine limbs as Leopard had. The limbs, joints, and feet of both horses were perfect. The fetlocks could not be found; there were none. The warts at point of ankle were wanting, and the osselets were very small. Large, coarse osselets show cold, mongrel blood. The crest of the neck in Linden was thick and hard, the same as in Leopard. This fact will astonish some fancy horsemen, who are let to believe that a thin crest is evidence of fine breeding. My experience of late years is that a thin crest belongs to a long-bodied, flat horse, of soft constitution. When Job said the “neck of the horse was clothed with thunder,” he had reference to the Arabian horse. As the shoulder possesses the greatest strength in a horse, it is reasonable to believe the neck, to which it is joined, should have strength in harmony therewith; and this bold, stout crest of the Arab was just as God wanted it. The mane in both horses was very fine and silky, falling over so as to cause one to believe the crest was a knife-blade, with blade up, for thinness. The head of Linden was the counterpart of Leopard in all ways; as in fine, thin muzzle, lips and nostrils; also small, fine, beautiful ears, thin eyelids; deep, wide jowls, etc. ; but the face looked much older, although Linden was a year younger than Leopard. There were two reasons for this difference in the countenance: First, the depression over the eyes in Linden was greater, which feature is said often to indicate advanced years in sire and dam when the foal was got. This would be evidence that the blood of Linden was very choice, for all breeders wish to get from their choicest-bred animals as long as is possible, even to extreme old age: and some of the finest horses I have ever seen have been produced by dams thirty-six and one thirty-eight years old. If I did not know these to be facts I would not repeat them in this book. “These black markings are held by the Arabs of the desert as evidence that the animal is of the thoroughbred Bint El Ahwaj breed, descending from the children of Ishmael, and from which breed came the Godolphin Arabian, and which Godolphin Arabian was in part founder of the French Percheron horse, also of the best strains of the English thoroughbred running-horse; and to which Godolphin Arabian imported Messenger was three times close bred, and very close at that in both sire and dam. Of course Arabian statements are traditionary, but facts in that country go strongly to support their traditions. This breed of which I am speaking, identified by the black markings around the eyes, are also known as the Kehilans, from these markings having the appearance of being painted with kohl, after the fashion of the Arab women; hence the desert name of Kehilans. From all I have been able to learn from abroad, it is most likely that the two horses represent the two thoroughbred breeds of “Kehilan” and “Kochlani,” the two choicest of the desert. I have tried to impress the reader with the feeling that I considered Linden the better horse of the two, and will give my reasons. During the inspection of the Sultan’s choicest horses, General Grant, who had an excellent eye, with judgment, expressed great admiration for the beautiful colt Leopard, and it was presented to him by the Sultan. Of course General Grant did not understand the Turkish or Arabic language, and could not comprehend any breeding given to him. His choice or selection had been entirely governed by superior beauty with wonderful perfection in the colt. After having presented Leopard to the General, the Sultan desired to make a special present of his own selection; and holding General Grant in the highest possible esteem as General-in-Chief of the victorious United States army under him, and also knowing him to have been twice President of this great American people, the Sultan would naturally have an individual as well as a national pride that his special present should be the best possible specimen of blood and breeding to be had through his power; and he knew what General Grant could not understand, that Linden represented blood which time would prove of more excellence than in Leopard. Under the circumstances, does any man suppose the Sultan would insult himself and his power by presenting an inferior selection to General Grant’s necessarily ignorant choice? Every breeder can understand this argument from selections made by gentlemen fanciers from stock he has bred and raised. It is pretty hard work to tell a gentleman who at first sight “knows it all” that he knows very little; but General Grant was not of that class, to assume knowledge. Since arrival in this country, the superior beauty and grace of Leopard has had a tendency to dwarf Linden in public opinion, encouraged through the influence of printer’s ink. He has been credited with being vicious, which the newspapers were very noisy about at one time, in and over a suit brought against General Grant for keeping such a horse. During the early spring and summer of 1880, also in 1881, I handled the two stallions many times in and out of their boxes at “Ash Hill,” at which time I had my mares there to breed, but never at any moment considered Linden vicious. I knew that he was all horse, and that as a stallion his disposition needed watching and nursing with a kind but firm hand. Petulant words, with habitual scolding, makes many a stallion ugly; and many a groom is more at fault than the brute. Arabian stallions are very sensitive to words, quickly appreciating the kind, cheerful good-morning. The human voice has a wonderful influence over the brute, and cross, ugly words they will in time resent. As I have remarked, I put these two stallions through their gaits many times, finding Linden the best at walk or at trot, because more even and steady. At the “National Horse Show” in New York City, I have said Leopard was twice awarded a first premium over Linden, to which by individual comparison he was entitled. The judge who would pronounce otherwise before four or five thousand people would be called very incompetent: but looks are deceptive. I bred six mares to these two Arabian stallions in 1880 and 1881, getting three horse colts and one filly. I selected kindred blood as found in Old Henry Clay’s daughters and inbred granddaughters. I handled the foals from the time they were born. Three were by Linden and one by Leopard. Not one of them is ugly or inclined to be vicious. All are broken, and not one has at any time offered to kick or to strike, although the dams of each one were high-strung, high-tempered mares, two of them particularly so. I found these Arab colts, while very small, required different treatment from mongrels, hence haltered and handled them myself up to this present time, in and about the stable, for that is the place the disposition is improved or spoiled. When two years old, my daughter could drive the son of Leopard anywhere, for he was fearless and reliable. At birth, the gray horse is black; and the true black horse is born of a brown shade. In the first moulting, the proper color shows itself to the breeder. the dapple-gray will carry a black coat into the second and third moulting, the black hairs always shedding first, so that the novice is frequently puzzled to tell what colored horse he is to have at maturity. The blue-gray grows to a white gray, but the dapple-gray holds its distinctive color longest, as a rule. Having bred my mares to General Grant’s Arabs in the spring of 1880, I became quite anxious to know all particulars relating to them, lest in future days some as yet unborn writer should tell his readers that General Grant’s horses were genuine imported Barbs, or maybe Andalusian horses, when any old man knowing to the contrary would be disputed into silence. The pedigrees of our horses credit Arabian blood frequently in some of the fastest and most valued animals; but attempt to unravel such breedings, and one lands among the “said to be’s,” which is not the case in England, or in Russia, or in France. They breed thoroughbreds of various kinds, and tell you how they are bred to a certainty; while with us, the time standard for the present generation settles it all, in which blood is of no value except in the black article known as printers’ ink. In fifteen years after Seward’s Arabs were imported, any authentic information as to their blood and breeding, their whereabouts, or their get, was a difficult matter to get at. The same was the case with those of James K. Polk, and so it has been in many instances where I have investigated. If Arabian blood was of value to England, to France, and to Russia, so it could be to America, for certainly we have not the self-sustaining types in horses to do credit to any civilized country as have the nations cited. Should we export our present horses? Having obtained all I could from Paymaster Smith, I awaited General E.F.Beale’s return from California. From him I did not get what I wanted. I then wrote to General Grant himself, and give below his reply. “Long Branch, N.J., July 28, 1882. “DEAR SIR, — About my Arabian horses, I cannot answer all your questions, but what I know I will give you. “I was in Constantinople in March, 1878, and visited the Sultan, and with him his stables. “All of his horses were of the most approved and purest blood (and there were about seventy horses in the stables I visited). I was told that the pedigrees of all of them ran back from five to seven hundred years (in breed). “Two of the horses that I then saw were sent to me as a present from the Sultan by the first steamer directly to the United States from that port. I do not know the name of the steamer, nor the date of its departure or arrival. They (the horses) were consigned to General E.F.Beale, of Washington City, who can probably inform you upon those points. Leopard was five years old when I first saw him, and Linden four, I think. I am certain as to the age of the first, and think I am right about the age of the second. The fact of these horses being from the Sultan’s own private stables, and being a present from him as an appreciation of our country among the nations of the earth, is the best proof of the purity of their blood. I now knew that neither General Grant, General Beale, nor Paymaster-General Smith could give me the identifying facts I wanted for fifty years hence. I remembered hearing my cousin, Mrs Dr. Anderson, of New Haven, Connecticut, say to me one day while visiting there, that General Grant had two horses arrive at that port by a foreign vessel, and that they were said to be Arabians. Upon which she went to the Doctor’s desk and took out some nails his blacksmiths had given him when they removed the shoes to re-shoe the stallions. “DEAR SIR, — I would say in reply that the Arabian stallions for General Grant were shod by my blacksmiths, Messrs. Palmer & Bishop, in this city of New Haven, Connecticut, on May 31 1879; that they (the horses) having arrived the day before direct from Constantinople by the steamer Norman Monarch, Dunscomb, commander. The steamer at that time was chartered to freight cartridges, guns, etc, to Turkey, from the Winchester Arms Company in this city. “She (the Norman Monarch) made the trip direct, entering and clearing at this port. My blacksmith went on board and removed the shoes from the horses, then took the stallions to his shop, where they were re-shod and kept in his stables until delivered to Mr. J.K.Levitt, of the Blue Bell, Darby Road, Philadelphia, Pa., and from where he exhibited them until delivered to General E.F. Beale at Washington City, for account of General U.S.Grant. I next called upon Major J.K.Levitt, of Philadelphia, who told me that in June, 1879, while driving a race at the Belmont Park, Mr. Edwards called upon him with a despatch from General Beale, requesting that he should go with Mr. Edwards to New Haven for two weeks at Suffolk Park, then at their fair, which association paid him for the exhibit. Next the fair at Dover, Delaware, gave him two hundred dollars and expenses to exhibit there. He then exhibited them a week at the Washington, D.C., Agricultural Fair; then at the fair at Alexandria, Virginia. Next at the fair at Cumberland, West Virginia, and lastly at the Doylestown Fair of Pennsylvania. It now being late in the fall of 1879, Major Levitt ceased to care for the horses, delivering them into the possession of General E.F. Beale at Washington, D.C., to remain. I have been particular in following up these two Arabian stallions presented to General Grant. I deemed their blood of important value to us. I would not condemn such breeders as ridicule Arabians, but would ask questions. If Arabian blood is of no value, why does England go back in her records to so many importations of Arabian horses to create and sustain her national thoroughbred running-horse? Why does Russia take pride in referring to her Orloff trotting-horse as of Arabian origin? Why does France, through government statistics, show that her famous Percheron draught-horse is moulded from the pliable blood of the Arabian? When men condemn Arabian horses, let them cease to extol Messenger, Diomed, Duroc, American Eclipse, Sir Archy, Boston, or Lexington, each of which owed its greatness to Arabian blood ; Diomed and Messenger being, as the reader knows, close-bred to the Arabian, and Messenger, which name has been the mouth-piece for our breeders and horsemen for seventy-five years, was three times inbred to the Godolphin Arabian. This entry was posted in Uncategorized and tagged Blunt, Huntington on 24 July 2008 by cmkarabians.